Chris Rees, playing on home ice at the Toronto Cricket and Curling Cub, defeated previously unbeaten Ken Gregory 8-3 to reclaim the Ontario provincial title he last held in 2008. Rees, with Carl Bax at 3rd, Alec Denys 2nd and lead Shauna Petrie, had given up an opening end 5 to Gregory in a 13-5 round robin defeat. The final began more quietly. The teams were tied at 3 after 5 ends, but Rees turned the tables on the Bradford team with a big 4 in the 6th, forcing Gregory to gamble, and allowing Rees to steal a final point in the 7th. Gregory, playing with Collinda Joseph 3rd, Frank Cannarella 2nd and Jim Primavera at lead, were behind in only 3 of the 34 ends they played during the round robin. The semi-final between Rees and Ilderton's Mark Ideson was played earlier this morning. Only Jacqui Kinahan on Ideson's rink had more than a year or so's experience but the team, with Mike Munro and Tony Reynen became London's first to reach a provincial playoff. 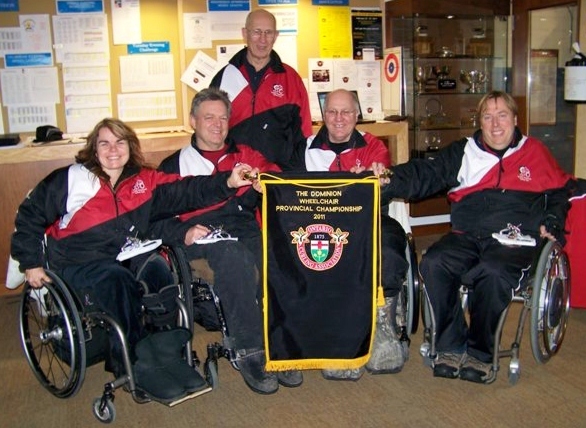 They earned their place by defeating reigning champion Bruce Cameron's Ottawa team in round robin play. Facing home-ice favourite Chris Rees in the semi-final, perhaps, like nervous mountaineers, they looked down. After holding Rees with hammer to one in the first, they gave up steals of 3 in the second and a further point in the third, and could not recover. Final score 8-3.
congratulations to Chris....good luck at nationals...good job to all the teams. Congratulations to the Toronto Team. They all played well, shot lights out and had a great win. Keep it up. I like to wish them all the best in the Nationals. Go Ontario Go! Way to go Chris!!!!! Way to go Toronto Team! Best of luck in the nationals!